I do compost everything that can be composted. I would llove something this nice instead of filling coffee cans. I think I peepll a milliom potatoes and always am putting them in the pile. I am the composting queen, yes right here in the suburbs. We eat a ton of vegetables too so we have lots of stuff to put in there (and probably a metric ton of coffee grounds over the years!). The most wasted thing? Junk mail. My husband doesn't like to put things with our address in the recycling (I'm not sure that I agree with this level of paranoia, but I allow it) so it all gets torn up and put in the regular trash. For some reason Klout just says 'You Can't Give Klout to the User Right Now' every time I attempt to - though I have certainly Klouted you many times before - what's up with that? The most wasted food in our household is crusts of bread as my teen won't eat them! LOL. I think we waste a lot of bread/buns in our house. They always seem to go bad prior to us using them all. We sort of compost. We have a compost container in the kitchen, but it does not get taken to a larger receptacle to be composted, it gets taken out to our chickens to eat. We don't waste a whole lot of food, but there are always scraps from cutting up vegetables, apple cores, etc. 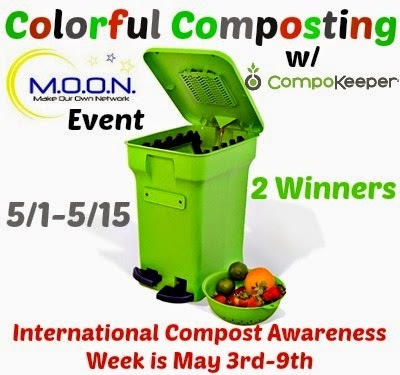 I'd love to win and be able to actually compost! Fruit and vegetable peels are what I throw out most often. We live in a rural area so I usually just toss them into the woods for the birds and squirrels. I would love to start composting to enrich my garden soil.